Now that the cold winter’s gone, before the hot humid summer arrival, why not go out in the countryside of Tokyo to enojoy one of the best seasons in the rich Japanese nature? 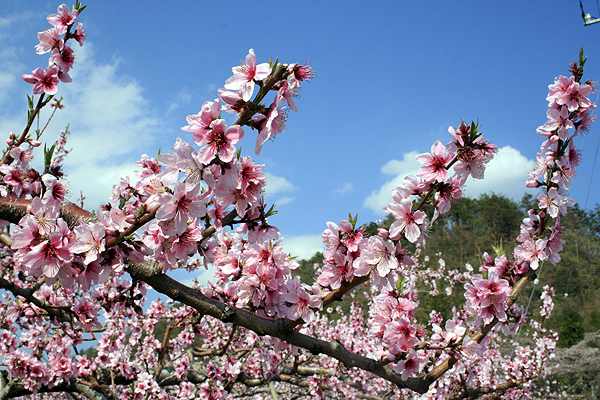 Peach blossoms in bloom in the peach feilds of Enzan. One of the most recommended places out of Tokyo would be towards West where there is the most famous mountain, the Fuji with the surrounding mountainous scenery. Even to those who feel the Japanese spring is already ‘hot’ would be feeling pleasant with the cool, fresh air around this area. To those who are not used to the cold weather may better take an extra top to avoid catching cold as it get’s chilly after sunset. 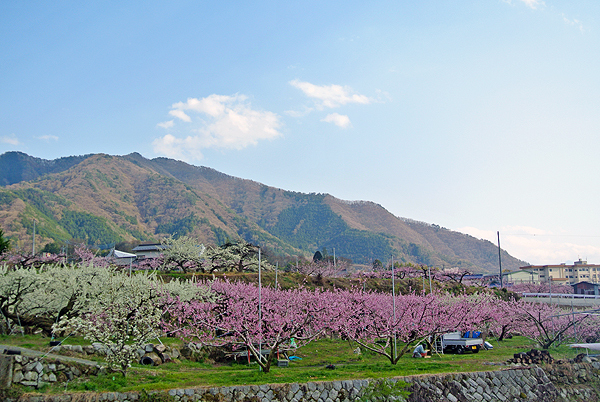 Apart from the beautiful sceneries of the mountains, you could enjoy the continuous scenes of fruit fields rich in bloom with fresh spring green sprouts adding more beauty of this season. The panorama is wider and open here, compared to the big cities with many skyscrapers blocking your eyesight from the sky which should bring you back the strength which should responce to the nature’s power. 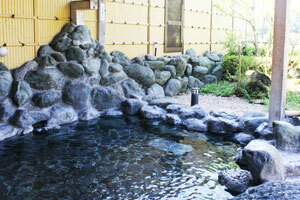 If you could manage to enjoy the Japanese Spa, that should be perfect! So, why not take the route below and drive off into the atrmousphere rich in spring blessings? Take Chuo Expressway from Tokyo towards Yamanashi. From the Exit of KATSUNUMA I.C. and go straight for about 300m on the Route 20 (KATSUNUMA Bypass) at the first intersection, KAMIIWASAKI. Turn right then take Route 34, heading OTSUKI (大月)and TOKYO. Go straight along the road for about 300m, and at the second intersection, KASHIWAO, turn left heading north. Continue takeing Road 34 then go straight for about 2km. At the roadside, there are many fruit farms where tourists can enjoy picking and eating fruits such as grapes, peaches, cherries depending on the season. This route full of fruit farms on both sides of the road is called the FRUITS LINE. 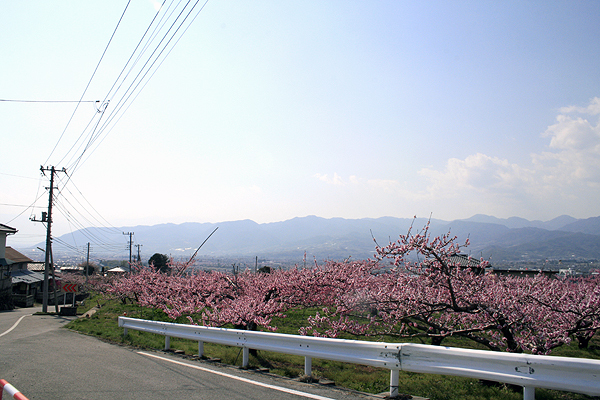 Driving along thr ‘Fruit Line’ on a sunny spring day among the peach blssoms. 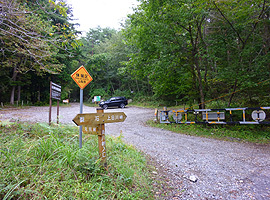 At the intersection, TODOROKI, turn right and take Road 411 (OUME KAIDO, DAIBOSATSU LINE / 青梅街道 大菩薩線) and go straight the mountainous road for about 13km. You will find an old-fashioned building ahead. That is your destination after enjoying the drive through the rich natire. Getting into the parking would be is a bit difficult as the entrance from the road is quite sudden. We have made mistakes twice and U-turned to get in there. Take right to enter. It will take about an hour and a half to reach there from Tokyo and a bit difficult to reach. You may lose your way around the roads among the fruit fields but keep looking orof the fruits if you are at the right season which you cannot experience in other countries. If you are here from May to mid June, cherries would be the season, from June to July peaches, from July to mid October grapes are there to serve you! You need to pay about 1,500 to 2,000 Yen (depending on the fruits) to enjoy picking, eating and taking back the fruits you’ve picked (though quantity of taking back is limited within the fee). Fruit picking is called ’KARI or GARI / 狩り’ in Japanese and you will find many flags posted with the word ‘桃狩り / Momo -gari – peach picking’ and ‘ぶどう狩り / Budo-gari – grape picking’ around this area. Peach fields of one farm. In about 3 months, juicy peaches are ready to be picked! There are many farms where you could enjoy this attraction within the Kofu Basin, the basin area of center of Yamanashi prefecture surrounded by mountains, but if you are heading towards the Daibosatsu-no-Yu to refresh and end this outing, the best place to enjoy the fruit picking maybe the Enzan area which is on the way. If you like mountain climbing, why don’t you try ‘Daibosatsu Toge / 大菩薩峠’? which consists of folded mountains of 1,000 to 2,600 meters in height. 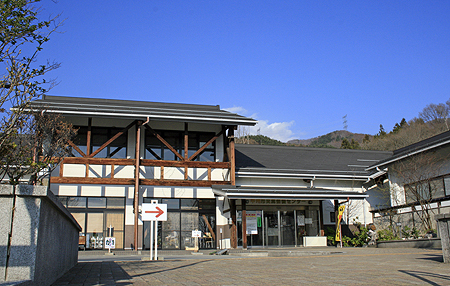 The range lies in the Chichibu Tama Kai National ParkW. ‘Daibosatsu Toge Tozanguchi / 大菩薩峠登山口’ bus stop. 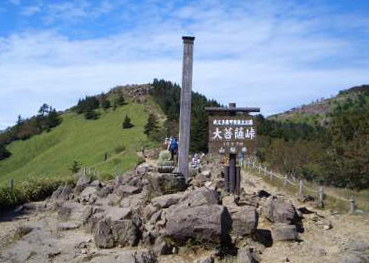 The starting point would be the bus stop of ‘Daibosatsu Toge Tozanguchi / 大菩薩峠登山口’, the start of the mountain trail. 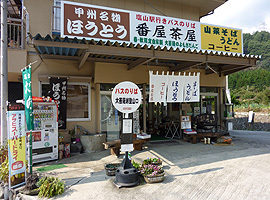 If you wish to go by your car, you can drive up to ‘Kamihigawa-toge / 上日川峠’. 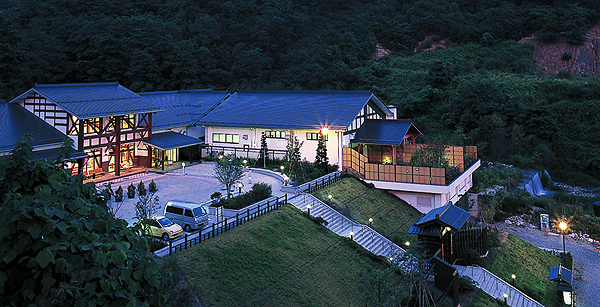 There is a lodge named ‘Lodge Chobei / ロッジ長兵衛’ where you couod get the latest information on climbing. You can park a car without fee at their parking lot. 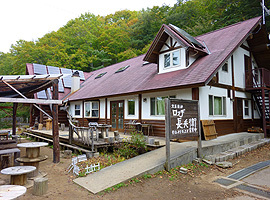 ‘Lodge Chobei / ロッジ長兵衛’ where you could get latest information on mount climbing. The trail route is about 15km but will be going up about 1,000 m with the altitude. Parking within the site of Lodge Chobei. The slope is not so steep where you will have enough scope to enjoy the great view which was selected as one of the ‘100 Best Woods of Yamanashi’. About an hour walk will take you to the fist destination, Daibosatsu-toge (elevation: 1897 m) where you can see the beautiful and splendid views of the Daibosatsu Lake, Kofu Basin below, Southern Alps and Yatsugatake. ‘Daibosatsu Toge / 大菩薩峠’ sign, one of the goal of your way. Mountaineering beginners or fun hikers can go down here. But if you still have enough power left to climb for another hour, you could head for the top of the mountain, ‘Daibosatsu-ryo / 大菩薩嶺’.. Or maybe, you can have your lunch here and see if you recover at a mountain hut, then decide. Below is a 360-degree view from ‘Kaminari Iwa / 雷岩’ near the mountain top to give you an image of your decision. The mountain top, ‘Daibosatsu-ryo / 大菩薩嶺’ is, on the other hand, is among the bush on the small plain… It may look as though there’s no need to head for the top but it should be easier for you to find your way back from here. 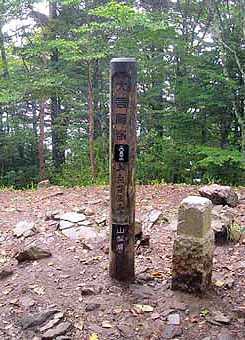 ‘Daibosatsu-ryo / 大菩薩嶺’ post sign at the top of the mountain. Better head here to go down safely. The route is not so difficult for the beginners like us. It would take about 5 hours of hiking in total. We don’t recommend you to climb the mountains in winter when there are lot of snow but in other seasons, we are sure that you will have a lovely time and experience! Looking down at the site of ‘Daibosatsu-no-Yu’. Photo from ‘Koshu Ryoko’, an official sightseeing page by Koshu City. 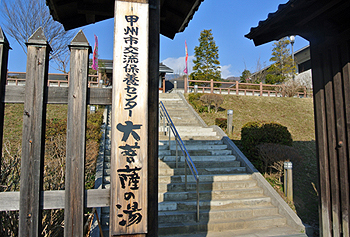 From the starting point of the mountain trail there is the spa, ‘Daibosatsu-no-Yu / 大菩薩の湯’. In Japan, there are many spa facilities of various types from big and gorgeous modern facilities to old-fashioned and rustic small types. 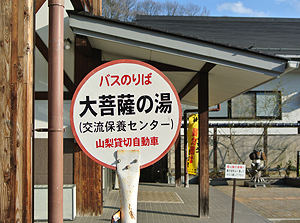 ‘Daibosatsu-no-Yu / 大菩薩の湯’ is surely the latter one but has a very high quality hot springs and we strongly recommend you to visit here! 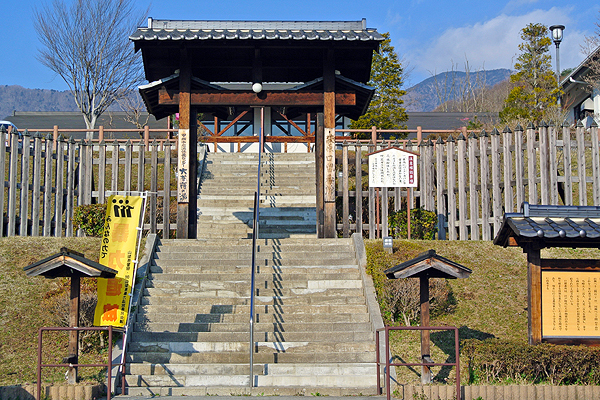 Entrance gate of the spa, ‘Daibosatsu-no-Yu’. Go up the stairs to get to the spa site…. The hot spring of this zone, Enzan area, is high alkaline type (10.05 pH) and it arose more than 10 milion years ago, deep beneath the surface of Japan. If we say “high alkaline” you may imagine that the water has an acrid smell or it would sting your skin. However, the water here is very smooth and silky which will take your fatigues. The building of the spa. You could reach there also by train and bus. From the Enzan station of JR East, Chuo MainW, there is a bus at 9:30, 11:20, 12:40, 14:28, 17:30, 5 times a day. The bus stop just in front of the building. Address : 730-1 Enzan-Kami-Odawara, Koshu-shi, YAMANASHI Pref.